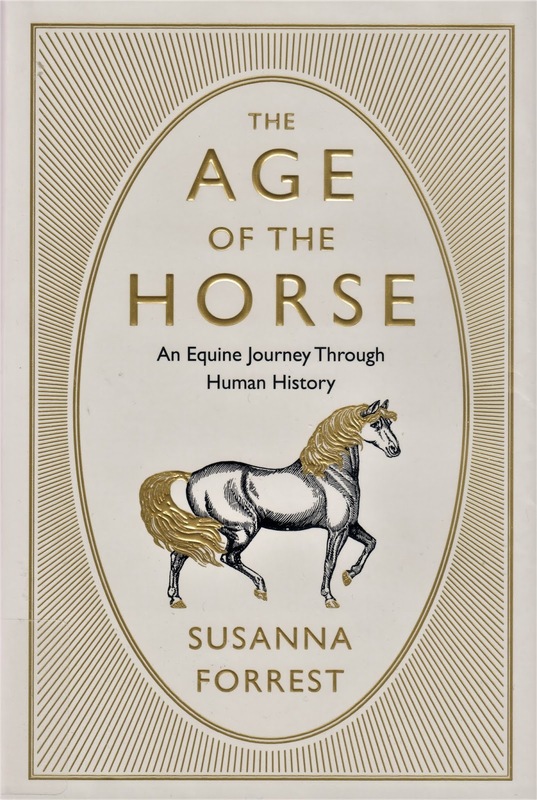 Susanna Forrest: The Age of the Horse: An Equine Journey Through Human History (New York: Atlantic Monthly Press, 2016, 2017). Brilliantly written, fantastico! Forrest clearly loves horses, but does not shy away from any aspect of their history or roles in conjunction with human beings. Chapter headings (not including their subheadings; originals in caps): "Evolution, Domestication, Wildness, Culture, Power, Meat, Wealth, War." The height of exploiting the horse must include the height of the British Empire. Certainly it was up there. "And so we reach the scrum of our London gentleman's horse-powered Britain, with its vanners, bussers, cabbers, pitmen's horses, farm horses, cab horses, costers' donkeys, trammers, drays, ferry and railway horses, all leaning their weight into their collars and drawing the nation along." (Pages 178-179). 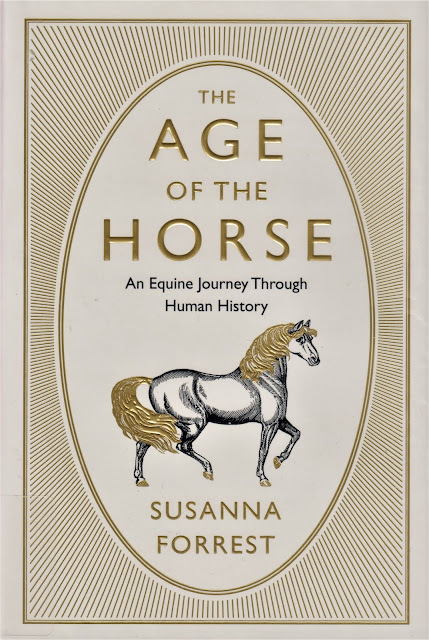 "By 1871, there were as many horses in the city as in the countryside, and by 1901, urban horses outnumbered rural by two thirds to one third." (Page 179). Contrary to popular imagination. The change from horse-driven reality to truck and car-driven reality was even more shocking than the onset of self-driving vehicles will be in the near future. A similar "future shock" moment arrived with the replacement of the analog world with digital technology at the beginning of the 21st century. Think in terms of dramatic "tipping points" of the past, present and future. This is just one of may reasons that Forrest's The Age of the Horse is so riveting. Horse Progress Days -- among the Amish in the 21st century, Forrest observes a twelve-horse team on display. "When this juggernaut marched on . . . it was like standing by as a siege engine passed: the air was filled with the high jingle and clink of the connectors and heel chains, bits champed and mouthed, the work of muscle and mass, the soft rush of the Ohio soil as it was sliced deep, caught and turned over by the plough, leaving a black, shining and broken wake behind like a harbour ferry's." (Page 189). Forrest crafts scores of such evocative, even exciting sentences, right up there with Marcel Proust and Vladimir Nabokov, among others. I am deeply impressed. I also like the fact that she wields the word "poleaxed" on more than one occasion. It sticks to mind. Vivid descriptions do the job repeatedly. When Forrest is visiting China after "Golden Week," industry has paused long enough for air pollution to abate. "Over Chaoyang Park on the fourth of seven Beijing ring roads, the skies were deep blue and there was a fresh, brisk breeze that bent the tops of the silver birches lining the entry roads." (Page 280). To the Great Wall: "A rampart of rocky slopes rose straight from the plain, littered with huge yellow boulders, and the neat, grey crenellations of the restored Wall rose and fell along the peaks and gorges as vertiginously as a roller coaster." (Page 289). Observing a bullfight in Portugal: "There was a cry and the gate flew open, clapping against the barrier, and out came the black bull, a surge of dark energy and muscle so thick that it guttered over its narrow rump." (Page 322). On the adaptability of horses during the First World War of 1914-1918: "Even in Flanders in the Great War, the horses soon became accustomed to the shattering boom of shellfire and continued to pull their wagons as houses, roads and people disappeared into blasted mudscapes." (Page 334). Horses prefer "cohesion, space and synchrony." (Page 339). 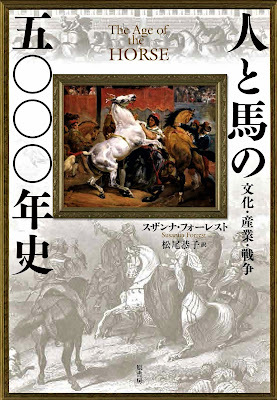 The Age of the Horse is a stellar work upon which I'm still ruminating three days after finishing a first read-through -- a remarkable occurrence in the digital age, and something to be treasured.